Cut the drumsticks 2cm length .Take the pan add 3 cups water, drumsticks, sambar powder, hing & salt. Allow to boil until drumstick soft. Meanwhile cook the moong dhal in a pressure cooker & keep it aside. Take the small pan, add one tsp oil,add urad dal, peppercorn & roast it. Allow it cool & grind with coconut to a course paste. Now add the moong dal, coconut paste & mix well. Heat oil in a pan add mustard seed, channa dal , fenugreek seed and allow to temper & add to the porichakuzhambu. murunkka poricha kozhambu looks fabulous and am drooling right now :) they are making me super hungry dear !! Drumstick is my fav but since of later, finding it over here is not easy. 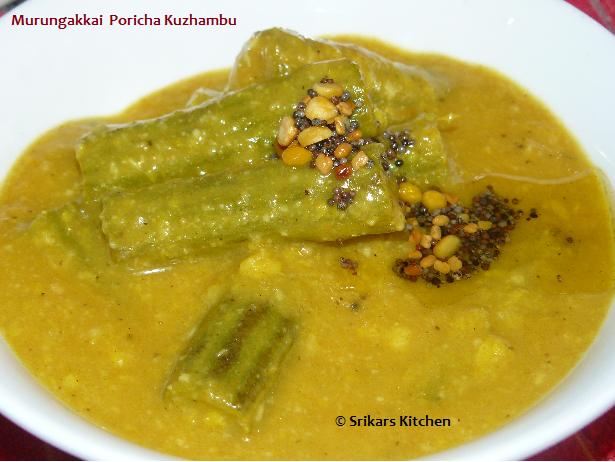 Adding drumstick into sambar is fabulous and I have to say, really have to say that the dish is so inviting.